#7276 Smooshee Cuddlers "Beth On Her Bicycle"
FPT14776 - Beth - Female Smooshee with pre-printed face and clothes. She has orange fabric "hair", a blue eyes (the other eye is winking), a pink nose, and a pink line smiling mouth. She wears a preprinted 2-piece hot pink outfit with tiny blue square "dots". The shirt is short-sleeve with a yellow "S" for Smooshee on her chest. Beths outfit shows her belly and pink bellybutton. She has white printed shoes with a strap across the top, and a blue dot "buckle" on the side. Beth is not marked with a model number, but she does have a small tag sewn onto her back marked "S" for Smooshees. Measures 5" long (including big orange hair), and 3" wide. FPT16198 - Small white sleeveless dress with multi-colored polka-dot and star prints all over it. The bottom edge of the dress has a small ruffled skirt-type edge. FPT14777 - Small white bicycle with 2 pink knobby wheels that really roll. 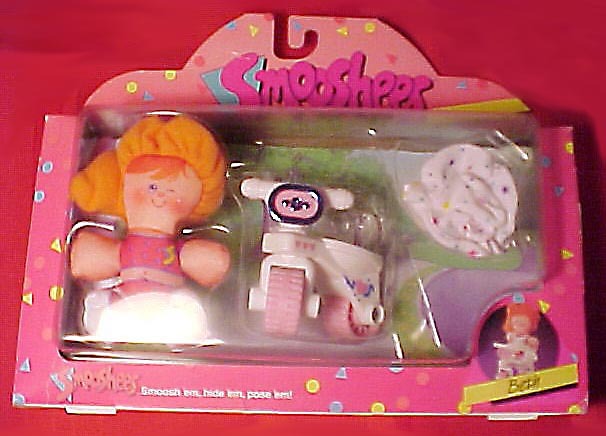 The bike has a clear plastic dome on top that a Smooshee can be smooshed into. The dome has an open hole on top and on 2 sides. The bike has a white handlebar that turns the front wheel, and it has a pink licence plate on the front with a blue edge and a blue "B" for Beth in the center of 2 blue hearts. The bike has 3 pink heart designs on the front sides (above the front wheel), and a pink heart with blue ribbon and confetti designs above the back wheel. The wheels are wide to prevent tipping. FPT16199 - Small blue sleeveless dress with thin double white lines. The bottom edge of the dress has a small ruffled skirt-type edge. FP7276BOX1988 (Box ONLY) - Sold in a 11" long, 8-15/16" high, 2-3/4" deep display box.